The international signing period began last week, and the Red Sox were ready: the organization spent nearly $4 million in the first two days, more than double their allotment. The lion's share of the spending was on two 16-year-old pitchers: Christopher Acosta, a 6-foot-3 Dominican right-hander, and Anderson Espinoza, a 5-foot-10 Venezuelan right-hander. Both of the righties are regarded as the the top two pitching prospects available in the market. According to MLB.com, Acosta (Pictured) has an impressive repertoire for a teenager: his fastball reportedly sits between 88 and 92 mph, his curveball has good rotation and bite, and he sports an advanced changeup, which scouts says is his best pitch. He signed for $1.5 million, and is the 8th best international prospect on MLB.com. Many scouts, perhaps unfairly, have already begun comparing Espinoza to another slight righty from Latin America: Pedro Martinez. Per MLB.com, Espinoza features a fastball between 91 and 93 mph and a curveball between 71 and 73 mph. He signed for $1.8 million, and is ranked as the 10th best international prospect on MLB.com. The organization also signed four other notable players: Nicolo Clemente, a 16-year-old right-handed pitcher from Italy; Roniel Raudez, a right-handed pitcher from Nicaragua; Diosmar Cortez, another Nicaraguan pitcher, and Elwin Tejada, a shortstop from the Dominican Republic. Raudez signed for $250,000; Cortez for $100,000, according to Nicaraguan journalist Gerald Hernandez. Tejada received a bonus of $300,000, according to Ben Badler of Baseball America. Clemente signed for an unknown amount. In system news, two position players were called upon as late additions to the Futures Game: Pawtucket catcher Christian Vasquez, who will compete on the World Roster, and Portland second baseman Sean Coyle, who will compete on the US Roster. While Anthony Ranaudo's rotation mates in Pawtucket seem to have received all the attention this season, the tall right-hander is making his case for a promotion. For more on this, check out this ESPNBoston.com story from SoxProspects.com's Matt Huegel and Ian Cundall. Not surprisingly, Coyle and Ranaudo were named Players of the Month for their stellar June performances. Coyle hit .348/.450/.652 in June with an organization-leading six home runs. Ranaudo was also excellent: he posted a tidy 1.47 ERA and 0.82 WHIP in 36 2/3 innings across six starts. In the latest edition of SoxProspects.com's Scouting Scratch, Ian Cundall evaluates the stockpile of arms in Double-A Portland. Among the featured is Miguel Celestino, a 6-foot-6 right-hander who as recently promoted to Pawtucket. Promoted alongside Celestino was 2012 top draft selection Deven Marrero. Marrero, 23, has a reputation as a slick-fielding shortstop, but it's the progression with the bat that has earned him the promotion. In Part 1 of the latest edition of the SoxProspects.com podcast, the guys discuss take stock of the lower half of the system through the season's midpoint. 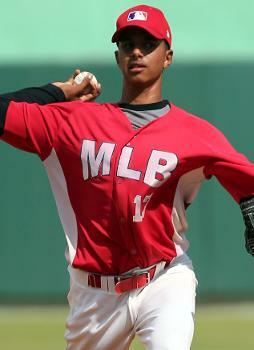 Also discussed is the promotion of top prospect Mookie Betts to Boston. In Part 2, the guys take a look at Salem, Portland and Pawtucket. 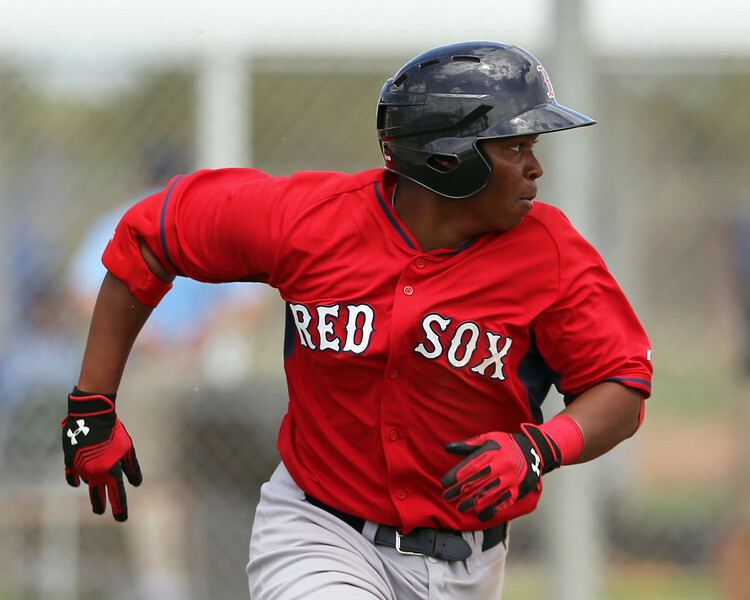 Recently promoted third baseman Rafael Devers (Pictured) has picked up in the GCL League where he left off in the DSL League, going 4 for 4 in his opening contest. The 17-year-old played only 28 games in the DSL, but his line of .337/.445/.538 warranted the call up. Devers was promoted on July 3, although it had been reported and circulated that the promotion was coming weeks prior. After a slow start to the season, Sam Travis, one of the organization's top choices in last June's draft, is beginning to settle in with the Lowell Spinners, writes Craig Forde of Boston.com. Lanky left-hander Henry Owens continues to roll through Eastern League opponents in Double-A Portland. On Sunday, Owens struck out 11 opposing batters in eight innings, cruising to his twelfth victory of the season. In 13 2/3 innings spanning two starts last week, Owens struck out 16 batters, walked only three and surrendered only three runs on 10 hits. He leads the Eastern League in every major pitching category, including ERA and WHIP. Photo Credit: Christopher Acosta by MLB.com and Rafael Devers by Kelly O'Connor.